Boatless in Bellingham — Not! (August/September 2008) -- At long last, CaptKathy's ship has finally come in. After being "Boatless in Bellingham" for more than a decade, Sheehan World publisher Kathy Sheehan is sailing the seas again in a vintage Catalina 36. 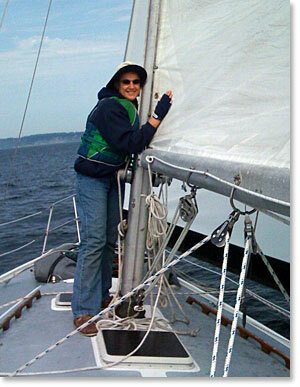 Sheehan and first mate Chuck Dingee partnered with two other Bellingham couples to purchase the 1983 sailboat for a good price and share the expenses and benefits of having a cruiser in Bellingham Bay all year round. Peter Hallett, industry relations manager at SPIE, and Professor Dave Wallin of Western Washington University's Huxley College are Sheehan's partners in the Bellingham sailing syndicate and selected this Catalina after several months of boat shopping. The boat has the original No. 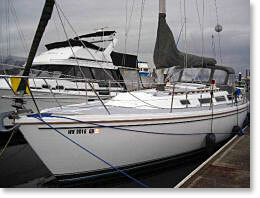 82 mainsail, an older jib with roller furler and a diesel engine. She has new running rigging, new interior upholstery, new exterior canvas (mainsail cover, dodger and bimini) and sails wonderfully with new bottom paint applied immediately after purchase in August. Her cockpit and cabin are quite roomy, with sleeping accommodations for up to seven people and enough headroom in the galley for the 6-foot-6 Hallett (and almost enough elsewhere). Unlike other fiberglass sailboats from the 1980s, this Catalina does not have a "blister" problem on her bottom and, except for a few items that need the usual maintenance and/or upgrades (electronics, dinghy, teak finish), she appears to be in very good condition for her age. Immediately after purchase, Sheehan, Dingee and Wallin gathered a crew to make the five-day voyage to bring the boat from her former port in Olympia to her new home in Bellingham. Hallett then organized a five-day cleaning "party" involving his two sons and several gallons of bleach and Simple Green to make the boat look like new. Now the heat is on to determine a new name for the boat. After considering several possibilities (Star Charter, North Star, HoriZen, Elysian, iBoat), Sheehan is leaning toward reverting to Notorious' previous name, Wind Singer. "This boat sang and hummed all the way home," she said. "One night in the port of Edmonds, the boom was even humming in the slip." In addition to having a musical mate in Dingee, the boat has numerous pieces of equipment like winch handles and life jackets that are marked property of "Wind Singer," Sheehan said. "What's more, any bad karma incurred by the previous owner for renaming her Notorious would be blown away if we restore her original name." 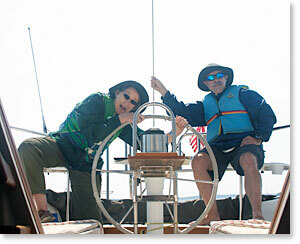 Suggestions for naming the sailboat are being posted on CaptKathy's Blog. Dingee, who sings and plays several instruments in the classic rock band Walrus, participated in four of the five delivery days in Puget Sound and accomplished quite a bit of cleaning. He pronounced himself seaworthy for the vessel and vice versa, adding that he would not oppose Wallin's plan to name the dinghy "PhDinghy." Some pictures for the latter part of our trip bringing her home with Capt. John Barnard are posted on Chuck's Web Gallery. All partners are keeping an open mind on the renaming of the mother ship and expect to come to a decision after each family has had a chance to cruise the San Juan Islands for a few days and get to know the boat. They have not ruled out naming the sailboat after a benefactor who would "invest" in some new sails. Sheehan and Hallett's employer has been approached to sponsor the vessel, but naming her SPIEBoat has been deemed unlikely. The Walrus would love the advertising value of having its musical mascot plastered on the sails, but band members are reluctant to invest when they have not yet recouped their expenses from their debut CD of original rock classics, Uncovered. Sheehan World readers can change the band's financial circumstances by attending the annual Walrus Virgo party at the Wild Buffalo on Friday, Sept. 12, and buying up some CDs! And Chuck promises to play the song he wrote for CaptKathy in 1993: StarCharter.